The tongue-biter parasite is infamous for living inside the mouths of fish and replacing their tongue. But that parasitic crustacean is not the only parasite with a predilection for that part of host - the tongue is also the preferred site for some species of Halipegus, a genus of digenean trematode fluke that lives in frogs and toads. While Halipegus doesn't replace the tongue the way the tongue-biter does, but they are very particular about where they hangout. Specifically, the adult fluke attaches itself to the lingual vein under the frog's tongue. While that may seem oddly specific on Halipegus' part, in fact many parasites are like that - not only are they particular about what host they infect, but they can also be very picky about which part of the host they live in. To a parasite, the host is a collection of very different habitats and only certain parts might meet the parasite's very specific needs. But not all hosts are equal, and a parasite that infect different species of host might also behave differently in each of them. A pair of researchers from Oklahoma State University conducted a series of experiments to find out more about Halipegus' specific preferences. They collected seven different species of frogs and toads from various locations in Oklahoma, and infected them with a species of fluke call Halipegus occidualis to observed how the parasite behaved and developed in those different hosts. To control for natural variations and to ensure that the parasites they are using is the right species and not some other similar-looking cryptic species (see this for example), they used parasites from a colony of H. occidualis which they have been maintaining in their lab. They exposed the frogs to larval H. occidualis by feeding them with seed shrimps which they have previously infected with H. occidualis. This procedure through which the frogs are exposed imitates the process of how frogs in the wild become infected with this parasite. After exposure, they inspected the frogs' mouths everyday for the parasite's presence. When H. occidualis is initially swallowed by a frog, it does so as a tiny larva encased in the body of an arthropod. The digestive action of the frog's stomach free the fluke from the arthropod host, and it then migrate to the frog's mouth over the course of a few weeks to develop into a sexually-mature adult. Or at least that's what happens in most frog species. 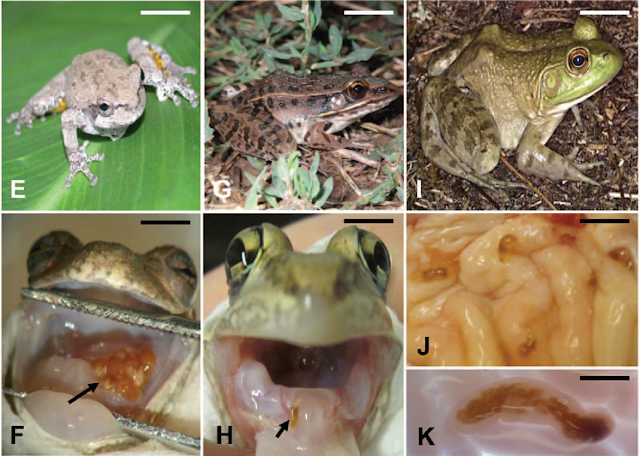 For six of the frog species in the experiments, H. occidualis showed up as expected under their tongue as mature, egg-laying flukes about 6-8 weeks after they have been fed with infected seed shrimps. The parasite was most successful at establishing in the American toads (93%) and had comparatively lowest success with the southern leopard frogs (67%), but aside from that, there were no major differences among those six species in terms of how H. occidualis performed. But things were a bit different in the American bullfrog. In that host, H. occidualis never show up under the tongue - instead, they simply stayed in the stomach and developed to full maturity there. It seems that not only is H. occidualis very specific are where it settles, it will also adjust accordingly if the host is different, to the degree that it would do so even if it has already developed into a fully-fledged adult fluke. When the researchers conducted further experiments where they transplanted adult flukes from under the tongue of gray tree frogs to other species of frogs, the flukes were quick to adjust. When the flukes were transplanted from a gray tree frog to yet another gray tree frog or a green frog, the fluke will move to its usual spot under the host's tongue, even though it is now in a new host. But if those flukes were transplanted to an American bullfrog, the flukes would migrate to the bullfrog's stomach. Furthermore, when those parasites were then extracted from the bullfrog and transplanted back to the tree frog, they went back to living underneath the host's tongue. So what so special about the bullfrog, or specifically its stomach? At this point, it is not entirely clear. Perhaps the bullfrog stomach has some kind of chemical that encourage the fluke to stay instead of migrating to the host's tongue. While a parasite might be very specific about where it exactly it lives in the host, it might not always behave the same way when it finds itself in different host species. For a parasite like H. occidualis, not all frogs are equal. Nematodes (roundworms) are common parasites which are found in all kinds of animals. The study featured today is a report on a species of nematode reported for the first time in the false coral snake (Oxyrhopus guibei). The false coral snake is a non-venomous snake which mimics the highly venomous coral snakes. The snake in question had been living in captivity for a week at the National Institute of Tropical Medicine (INMeT) in Argentina before it suddenly died. It had appeared healthy until it just keeled over one day. When researchers dissected it, they found that it was full of parasitic roundworms that were identified as belonging to the species Hexametra boddaertii. The researchers found a total of 120 H. boddaertii in the snake; 68 of which were dwelling in the body cavity while a further 52 were living in the snake's digestive tract. 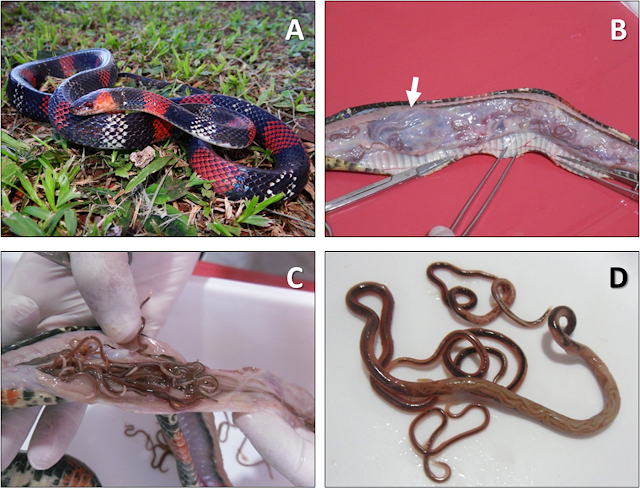 This species of parasite has been recorded in other snakes before, but this is the first time it has been found in the false coral snake, and the first time that it has been reported from Argentina. Hexametra boddaertii belongs to a group of parasitic roundworm call Ascarididae which also include roundworms that infect various domestic animals and humans. During the snake's stay in captivity, its carers had attempted to deworm it by giving it Fenbendazole - a de-worming drug which is commonly for treating parasitic infections in various domestic animals. They also tried to disinfect the enclosure, but neither seemed to have had any effects on the snake's parasite burden. But whether they were adults or juveniles, those parasites' presence certainly took their toll on the snake. Parts of the the snake's body cavity showed signs of calcification, its lungs were filled with excess fluid, and its gut lining were inflamed and congested. Given the number of worms the snake had and how well-developed most of them were, the snake most likely had acquired those parasites long before it was brought into captivity. In addition to providing a new parasite record, this study also revealed a potential risk associated with handling snakes - larvae of other Hexametra nematodes from snake faeces have been reported to successfully infect the crab-eating macaque, so if given the opportunity, there is some potential for H. boddaetii to jump host into primates (including humans). Peichoto, M. E. et al. (2016). First report of parasitism by Hexametra boddaertii (Nematoda: Ascaridae) in Oxyrhopus guibei (Serpentes: Colubridae). Veterinary Parasitology 224: 60-64.